The first gardening catalogs have already started arriving. Before you sit back and start envisioning next year's garden, make sure you're on the mailing list for your favorite catalogs. The companies listed here are popular for both the products and plants they offer and the information their catalogs contain. They can all be found online and most will send you a free print catalog, which you can order from their web sites. Their specialty is wildflowers, but you'll also find: grasses, perennials, trees, ferns, books and more. Online only, no catalog. Annie's began by specializing in seed grown annuals and expanded to include perennials. Unusual plants and old-fashioned cottage garden flowers are featured, as well as many fragrant and native wildflowers. Great service. Lots of seed varieties you won't find elsewhere. They do some of their own seed collecting and in 2004, boasted over 100 melon varieties alone. A good catalog for information too. A large selection of reasonably priced perennials. Their online catalog allows you to search by: zone, color, soil, height, bloom time, exposure and plant type. Brent and Becky used to run The Daffodil Mart, which they sold to White Flower Farm. They're brought their expertise to this new company, which offers the same excellent selection and quality that made The Daffodil Mart so popular. A favorite among home vegetable gardeners. They mostly carry their own hybrids, but they are dependable. They have always specialized in carrying seeds of great tasting produce with advice on how to prepare it. Greenmantle is run by two avid gardening enthusiasts whose impressive collections led to the creation of their nursery business. Fruit trees, antique and otherwise, and roses are their specialty, but keep checking as they add more and more variety. They bill themselves as being plants for western gardens, but they have such a great collection of drought tolerant xeriscape plants and so much information that I would recommend them for any area, except maybe the extreme south. High Mowing Organic Seeds is a Vermont based, family owned business that sells only 100% Certified Organic seed. They carry a diverse line of vegetables, flowers, herbs and sprouts, as well as a good cross section of cover crops and planting supplies. Jackson & Perkins might be best known for their roses, but they also sell a wide variety of perennials and garden accessories. Johnny's caters to short season gardeners, but there's no reason others can't benefit from their collection of sure fire performers and new introductions. They sell their seeds in small quantities, for home gardeners, for about .35/pack. Everything you could need to establish a water garden in your yard, including advice. The stop for great houseplants, tropicals and tender perennials. The catalog costs $4.95, but it is redeemable with your first order. For more great plant catalog listings, keep reading. Then make the garden your own with supplies and garden ornaments from some other great catalogs. Seeds and supplies for the home gardener and commercial grower, featuring a section devoted to certified organic seed and a tempting gourmet Italian vegetable seed collection. A family owned gardening business since 1949! Nichols started off selling unusual herb seeds and now carries a wide array of seeds and gardening supplies as well as cooking, brewing and craft supplies. Lots of interesting open pollinated, rare and unusual edible and ornamental trees, shrubs and plants. Seeds and gardening supplies from and for the northeast U.S., with an emphasis on sustainability and buying local. This Oregon based, online company is the home of LazyMan™ products to improve your soil. They also offer a wonderful selection of grass seeds for specific needs, including native grasses, as well as flower seed, repellents and all kinds of garden supplies. Organic vegetable seeds plus the unusual, like cover crops, pasture seed, even artichoke starts. They say it best themselves, "Over 600 varieties of fruit trees, berries, unusual edibles, ornamentals & supplies..."
Renee Sheperd is the founder of Sheperd's Garden Seeds, which she sold to White Flower Farm. Now she travels the world looking for interesting and unusual vegetable and flower seeds, testing them herself and then offering the best to us. I didn't see a paper catalog, but it's worth checking out her seeds online. This Canadian company has an extensive offering of herbs. They've also added everlastings, alpines, supplies and more. The granddaddy of the heirloom seed movement. Their catalog features a good range of their inventory of heirloom vegetables, herbs and flowers. But if you really want to be impressed, become a member and you'll receive the seed exchange catalog with thousands of seed varieties being saved and offered by other members. Their motto is "Goodness from the ground up." and this organic company can provide you with everything from seeds to fruit trees, cover crops, tools and know-how. Particularly targeted for the Northwest, but they also have many adaptable varieties of vegetables and flowers. One of the best catalogs for flower seeds. Specializing in vegetable, herb and annual flower seeds for urban gardeners. All garden seeds are packaged in recycled magazine packets. They also have indoor herb kits and growing guides. Best known for their wide selection of bulbs, Van Bougondien also has a nice selection of perennial plants. And they're a great source for calla lilies, dahlias and other specialty bulbs. A family owned company since 1981. This is an actual farm with a retail store, catalog and website. They offer more than 180 different varieties of perennial and annual wildflower seeds, plants and bulbs. A respected supplier of perennials, trees, shrubs and bulbs. They always get good marks for their service. Wonderful unusual perennials, at a price. The catalog is like reading a book. A family run nursery near Atlanta, Ga. Great selection of hydrangeas and unusual trees and shrubs, plus lots of wonderful perennials and vines. You've got the plants all picked out, now make the garden your own with supplies and garden ornaments from some other great catalogs. A lot more goes into a great garden than just plants. Without tools, fertilizer and whimsy, a garden isn't a personal statement - or a whole lot of fun. Thankfully, there are companies understand this. Here's a list of catalogs offering garden 'Extras'. Propagation, irrigation and ornamentation are all well covered here. Especially good for orchid growing and seed starting supplies. Interesting, well made tools and supplies for gardeners. Can be dangerous for browsing - they have many items you didn't know you needed until you saw them in the catalog. Great for gift ideas. Organic fertilizer and pest control for every problem. Good education in organics. 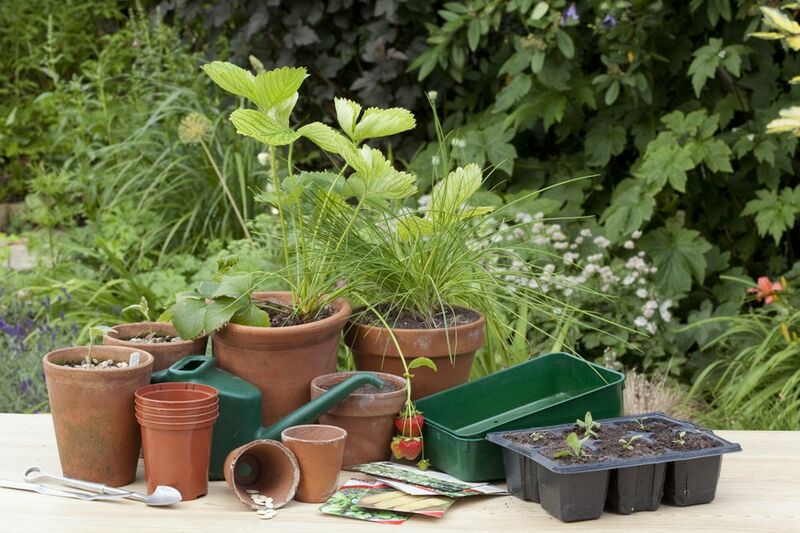 A great collection of neat and affordable garden supplies and decorations. Good for gift ideas. Well priced, quality tools and gadgets, not just for the garden. Professional quality tools, many hard to find. Prices aren't cheap, but the quality is good. Now that you've seen your options, you might want to order more plant catalogs.